Amazon Toying with Retail Stores? 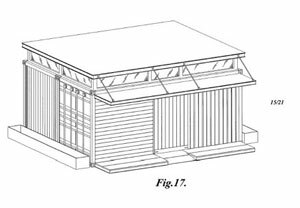 Amazon receives patent approval for a design for a mini-building, leaving investors wondering the purpose of the structure. Is Amazon ( AMZN - Get Report) preparing to launch its own retail stores? If so, the company's not talking. The online retailer received a patent earlier this week for a mini-building design that has sent rumbles throughout the retail world -- or, more specifically, on several online financial blogs -- of a possible brick-and-mortar business venture by the company. And while the designs for the building do resemble a storefront, it's worth noting that Amazon has also already toyed with pick-up locations in Seattle for its Amazon Fresh delivery service, which it discontinued in February 2008; the patent could, in fact, augur a reprise of those. An Amazon spokeswoman refused to comment on the patent, stating that company policy is to remain mum on patent filings. Amazon's design patent approved this week resembles a small store. If, indeed, Amazon were to embark on retail locations, analysts think it would only spell disaster. "The company essentially sells commodity items at terrific prices to drive revenue growth and free cash flow," says Charles Wolf, analyst at Needham & Co. "Physical stores would in no way contribute to this." While Apple ( AAPL - Get Report) did successfully transition to a retail format, "At least there's a raison d'être for the Apple Stores," Wolf said. "There would be none for Amazon stores."